Rumors have circulated for months that S&C Electric, Schneider Electric and Oncor had in the works a microgrid more sophisticated than any so far built in North America. Today the companies lifted the veil off the completed project near Lancaster, Texas. The new microgrid isn’t particularly large (1.25 MW), but oh what’s inside. Not one microgrid exactly, but four working together (or apart), offering a first-of-a kind automation that hints at the distributed grid to come. Industry visionaries describe a future U.S. grid where multiple microgrids can act in concert. With little or no human interaction, these microgrids of the future puzzle out a complicated dispatch of power and storage that they can share. The goal is to achieve highest reliability at lowest price and integrate renewable energy. The Oncor microgrid steps the industry toward that future. 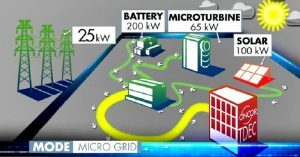 The four microgrids, or zones, include nine generation sources: two solar photovoltaic arrays, a microturbine, two energy storage units and four generators — operated by one microgrid controller suite. 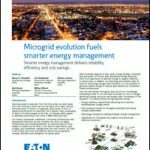 The microgrids can operate independently, together, or as one through a distribution automation scheme that leverages intelligent grid products from S&C Electric and Schneider Electric. “You have four different microgrids at the site that can be optimized separately. Each one of the zones has either a distributed energy source in it, or an energy storage unit. We physically can control each one of them independently,” said David Chiesa, S&C Electric’s director of microgrid business development. Further, the microgrid controller suite and distribution automation switches allow the system to actually sectionalize. The project can allocate generation from one microgrid to the other microgrids, as needed. This is done automatically with no human interaction. The microgrid not only automates dispatch, but also pricing signals, determining when it’s best to buy, sell or store power, again without manual intervention. “That’s another huge leap forward in terms of microgrids.” Chiesa said. The Schneider microgrid controller allows the system to look at prices 15 minutes, an hour, and a day ahead, and also take into account weather forecasts. The project also is rich with “inverter-based resources” and notable for its use of battery energy storage as an anchor resource — the resource it follows when it separates from the grid, said Philip Barton, Schneider Electric’s microgrid program director. With this project, Oncor is challenging the idea that utilities cannot innovate. The Texas utility is already notable for putting forward the idea of integrating 5,000 MW of battery storage into the Texas grid. Now it’s created a highly sophisticated microgrid — and did so within just nine months, Chiesa said. Oncor plans to offer the project as a learning lab for the industry, and has created a demonstration and visualization room at Oncor’s System Operating Services Facility in Texas. It is opening the project for tours, offered by both S&C Electric and Schneider Electric. A video about the Oncor project is available here. During a loss-of-power event, a combination of S&C’s advanced distribution automation equipment and Schneider Electric’s Microgrid Controller (MGC) use high-speed communications and distributed grid intelligence to automatically detect a problem on the grid. It starts with S&C’s IntelliRupter PulseCloser fault interrupter which detects an interruption in power, tests to see if the issue is temporary or permanent, and if it is permanent dynamically islands the facility. The system then uses S&C’s Scada-Mate CX Switches and Vista Underground Distribution Switchgear to automatically re-configure the distribution system while the MGC autonomously switches to alternative distributed power sources. “It does all of this in a matter of seconds, or faster than a customer could find their flashlight in the dark,” says Chiesa. The energy storage systems are the backbone of the microgrid, which include S&C’s PureWave Community Energy Storage System. 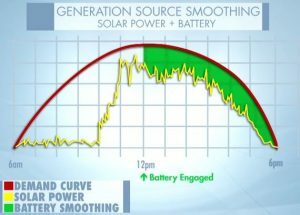 The onsite energy storage—which stores energy from either the utility feed or any of the facility’s generation sources—provides the voltage signal for the site, enables renewable integration, controls the microgrid frequency and is the first generating source to respond during an unexpected loss of power. The microgrid system also benefits from advanced grid technologies developed by Schneider Electric, including the PowerLogic load preservation system, the microgrid controller and a new technology called StruxureWare Demand Side Operations (DSO). Schneider Electric’s DSO model delivers economic optimization and dispatch of the microgrid distributed energy resources (DER), allowing the system to maximize renewable energy usage and storage while minimizing energy costs. DSO’s innovative platform makes this possible by leveraging market pricing signals, weather and forecasting information, historical energy usage data and real-time building information. “Oncor has a rich history of working collaboratively with its vendor partners and this is a great opportunity to showcase those relationships in a state-of-the-art microgrid facility,” says Michael Quinn, Oncor Chief Technology Officer. The Center, which also serves as the SOSF microgrid control center, displays the new technology that Oncor is using on their system. The demonstration room features a fully functioning SCADA representation of the microgrid to show how the system reacts to a loss of power event such as extreme weather. Once an event is created, the switching devices respond accordingly, clearing the fault, isolating the faulted section and restoring service from an alternate source. The switching devices, controls, communications and software shown are all real and completely functional. S&C and Schneider Electric will be demonstrating the system for the first time to attendees of the Third National Microgrids Conference, being held in Dallas April 14-16, 2015. Subsequent tours of Oncor’s microgrid can be arranged by e-mailing microgrids@sandc.com. To get a free copy of the Oncor Case study visit Schneider Electric’ Microgrid resource library. This is pretty cool! I can’t wait to see the applications of this in the future. This sounds exciting. It is interesting that this is one area that the U.S. has lagged behind when it comes to technology. These microgrids could be really great. This post is a year old and I would love to see an update as tho the progress of the microgrids and how well it is being received.